Let’s face it—if you don’t speak English nowadays, you’re not part of the global market. In my country, Syria, most people cannot speak English, much less write or read in this global language even though we’re a developing nation in dire need to communicate with the developed world. I started working in Damascus in 2014 and at every workplace, my colleagues thought learning English would make them ‘like Anan,’ and I took it as a compliment although there is so much injustice in the concept itself. As numerous UAE-based firms are opening back offices in Damascus and hiring remote employees, ambitious young Syrians are working hard to meet their needs for the experience and prestige they offer, and one of the key skills required by all those companies is English proficiency. I personally love English and believe it’s a language that liberates people and opens up a whole new world for them. Therefore, I have made it my mission to influence almost everyone I meet in Damascus, including my dentist’s assistant, to enroll in English language courses. I provided them with material and mentorship, helped them with assignments and acted as a conversation partner—but how much can I offer alone? Add to this that two of the main resources required for learning a new language are a challenge for most of the people who showed a real desire to become proficient in English: Time and money. The economic situation in my country has forced many youths to work while studying or take several jobs after they’ve graduated. This has left many with no time to enroll in language courses—and let’s not forget transportation and safety-related obstacles that made commuting a great challenge for many. Furthermore, professional language courses are very expensive for most youths in Syria, owing it to the high demand for them when most youths aim to either immigrate to the West or apply for scholarships abroad. Utopians is a non-profit educational voluntary organization that provides free professional English language courses for all levels. These courses are interactive, online and follow a flexible time schedule that suits all students. 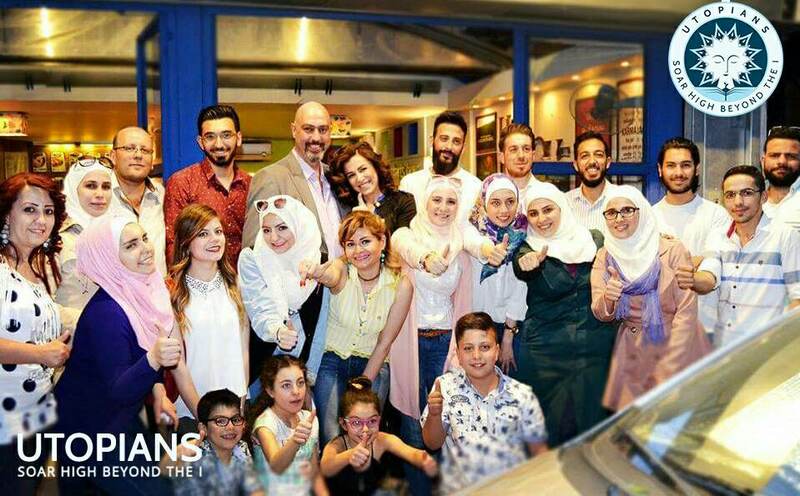 The initiative was founded by a group of Syrians in 2015 and today, hundreds of outstanding young volunteers of different nationalities have dedicated their knowledge and experiences to help develop their communities through this initiative. The first course kicked off in Oct. 2015 with 300 students and it was a huge success! This had led to opening more classes and launching the second course in March 2016 with 1,000 students, the third in Oct. 2016 with 1,200 students and the fourth in Sep. 2017 with 1,427 students. Utopians has taught English to around 3,927 people between 2015 and 2017 alone. Another group is created to act as a virtual classroom and it’s called the “Interactive Group.” This is a conversation group for students, assistant teachers and student affairs administrators. One lesson (PDF files and audio recordings) per week is posted on the Study Group. Students download these lessons and discuss them with their teachers. Students then discuss the lessons with the assistant teachers in the Interactive Group by sending audio recordings and typed text in English (no Arabic is allowed) in order to improve their speaking, writing and listening skills. The students sit for midterm and final exams in order to test the knowledge and skills they gained so far. Those who obtain high grades are allowed to move to the next level. Utopians’ volunteer teachers are professionals with years of experience in the field of teaching English as a second language, so the knowledge and skills students gain from these teachers are of great value and prepare them to sit for international tests like IELTS and TOEFL. The courses are time-flexible, which means students can study English during their leisure time while being closely supervised to ensure their commitment and growth. Moreover, unlike most online courses, Utopians offers interactive courses in which students interact with each other, with their teachers and assistant teachers, and with the initiative’s staff members. This motivates them to compete and show up for classes. Of course, let’s not forget that all courses are free, which means students don’t have to stress over financial problems and can continue to enroll in the next levels without thinking of how much it may cost.